These instant cheesecakes are gluten free and have no refined sugar either. As well as an after-dinner dessert, they could also be served as a breakfast option and are an ideal lunchbox filler when assembled in a plastic lidded pot. Kids won’t believe their luck when they spot this in their lunchbox! Blitz the ginger in a mini blender until finely chopped. Add the seeds, dates and coconut and blitz again to create a crumbly mixture. Sprinkle an equal amount into the base of each of your individual serving pots, jars, bowls or glasses and set aside. Beat the cream cheese in a medium bowl to loosen. Add the yogurt and lime zest and stir until well blended. Add the honey to sweeten if liked. Remove and discard the skin and stone from the mango and roughly chop the flesh. Blend it in a mini blender until really smooth. Dollop the cheesecake mixture and mango purée on top of the bases in alternating spoonfuls until both are divided evenly and used up. 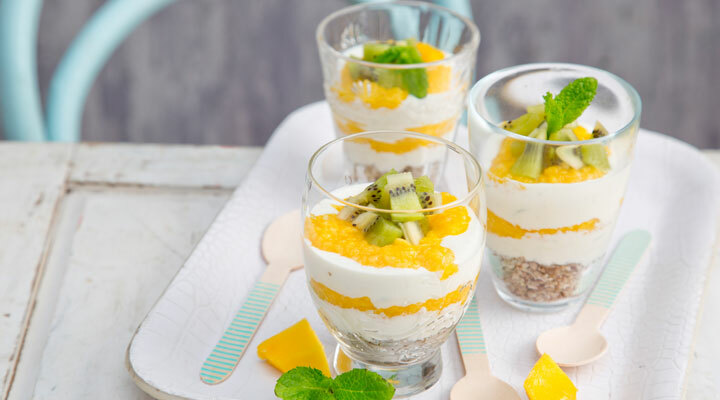 Arrange the kiwis on top, scatter the mint over (if using) and serve. TIP - If there aren’t for school, then you could use nuts like cashews, hazelnuts, almonds or pecans instead of seeds in the base mixture. Other fruits like pineapple, peaches or pears could be blended instead of mango. Passion fruit would also work well rippled through the cheesecake mixture. Serve with mixed berries on top instead of or as well as kiwi if liked. Add the seeds of one vanilla pod to the cheesecake mixture for additional flavour if liked.